Holy Diver Megaways is an epic online slot of Big Time Gaming filled with surprises. This video is set in the Middle Ages, where a brave knight is at your side to help you with all kinds of extra prizes, such as extra wilds, additional multipliers and bonus scatters. Tirelessly he walks with you at the bottom of the screen, simultaneously kicking open mystery chests. If it was not clear already, music plays a big role in the slots of Big Time Gaming. Holy Diver is just about the best-known song of the iconic American metal band Dio. The annoying and at the same time irresistible banjo tune in Bonanza was written by the owner of Big Time Gaming himself. 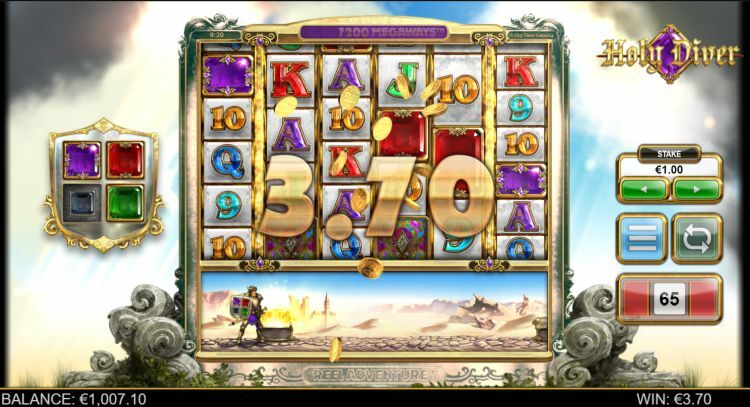 In the Gold slot machine, you can hear the classic sounds of Spandau Ballet’s mega-hit “Gold”. In Danger High Voltage, the crazy sounds of “Danger! Danger! High Voltage! of Electric Six. Anyway, back on topic, back to Holy Diver slot, because that’s what this review is about. Big Time Gaming once again succeeded with flying colours at uniquely implementing the Megaways concept. This slot has a lot to offer, so it is a real challenge for us to explain it clearly. In any case, we will do our best. 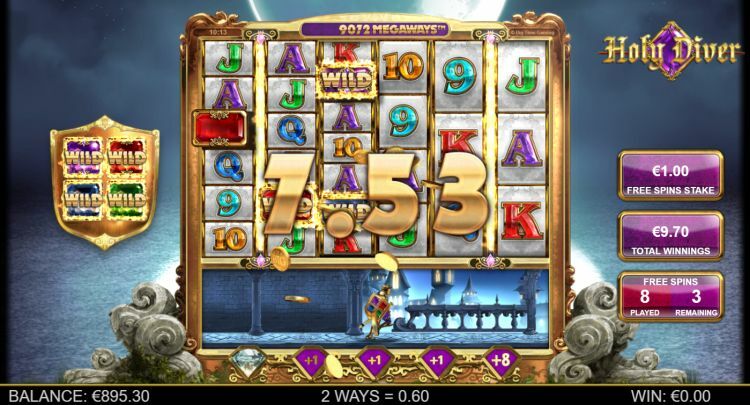 Right off the bat, you simply have to try this slot! How does the Holy Diver Megaways slot machine work? Holy Diver is at face value a regular Megaways slot. In the primary game, there are up to 117,649 ways to win. The symbols are a mix of 4 jewels, 6 card symbols and wilds. The jewels yield between 2 x and 15 x to a 6-of-a-kind. The card symbols (9, 10, J, Q, K and A) are worth between 0.5 x and 1.5 x the total bet for 6-of-a-kind. Betting is done from $€ 0.10 up to $€ 20 per spin. Depending on the level of the game you are in, the payout rate is between 96.39% and 96.54%. The variance of Holy Diver Megaways is considerable. It is possible to win more than 20,000 x your total bet. That’s a lot. Reel Adventure: Take on the adventure! Holy Diver is the first release of Big Time Gaming where they apply the Reel Adventure technology. This technology allows you to pick up all kinds of extra bonuses while playing, as an integral part of the game. You can also save for bonuses and progress to higher levels in the bonus games. The Reel Adventure technology makes playing Holy Diver a real adventure, full of surprises and twists. The guys and gals at Big Time Gaming are some smart cookies. 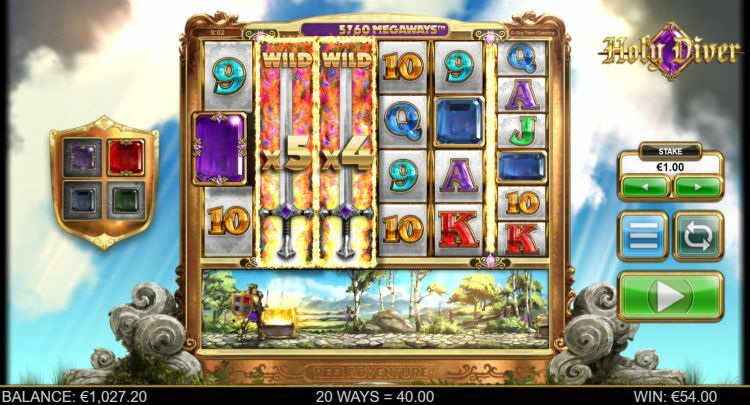 This slot game works as follows: under the reels, a knight walks along. Sometimes he walks, sometimes he runs. This knight encounters treasure chests along the way, which he opens effortlessly with a kick. Find the jewels in the treasure chests. You collect up to 4 jewels on the knight’s shield. Once the knight collects all 4 colours, you win the free spins bonus. There are 3 levels, each with their specific characteristics. 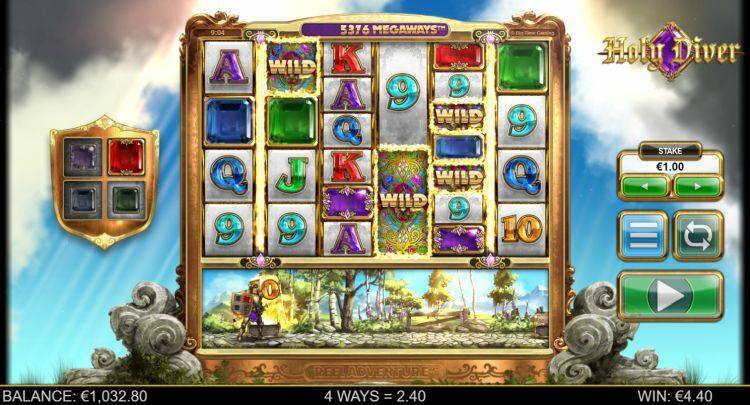 In any case, the jewels on reels 2 to 5 are always wild during the free spins. But the higher the level, the higher the multiplier. You also get (many) more different ways to win. Again during the free spins our big buddy the knight is still putting in leg work for us. He now tries to collect extra diamonds. 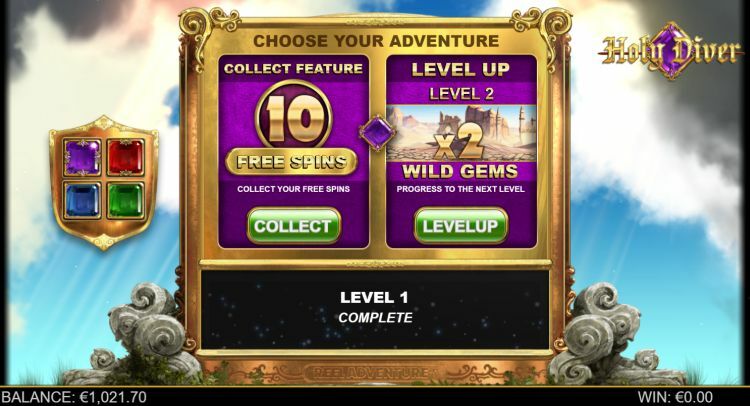 Every diamond gives +1 extra spin, and if you collect 5 diamonds, you get 8 free spins. Also, more symbols appear on the reels. Holy Diver is an outstanding new release of Big Time Gaming. Somehow this game developer knows how to come up with out of the box, new and exciting fun features. That’s why we recommend you giving Holy Driver a super big try. Where can you find Holy Diver? The Holy Diver slot is found at all reliable Big Time Gaming casinos. One of these Big Time Gaming casinos is Slots Million, which is one of our favourite online casinos. You can play the Holy Diver slot at Slots Million with a 100% bonus up to $€ 100 plus 100 free spins.